ECWA Neighborhood Council – ECWA promotes pubic participation in city government and its decision making processes, to make government more responsive to our local needs and requests, creating more opportunities to build partnerships with government and private entities to create more opportunities for our neighborhood. Election Day is June 15. 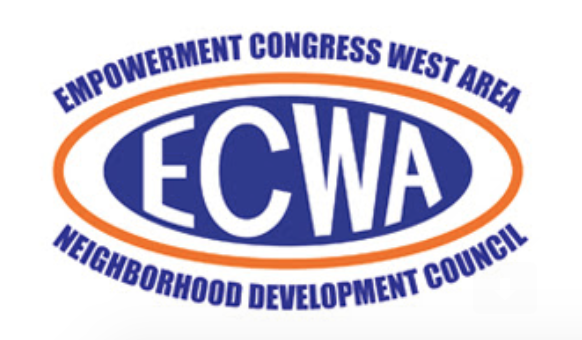 The Empowerment Congress West Neighborhood Development Council (ECWANDC) grew out of the “Campaign for a New Eighth District” initiated by Councilman Mark Ridley-Thomas on January 23, 1992 to enhance the quality of life for Los Angeles residents. Starting in 2002, the ECWANDC is now part of a citywide system of neighborhood councils established under Article X of the Los Angeles City Charter to promote more citizen participation in government and make government more responsive to local needs. ECWA was certified by the city of Los Angeles on March 23, 2002.